Pick up truck tool boxes ... click here for my recommended source for more info, more pictures, applications and pricing! You've got that new truck and now is the time to think about pick up truck tool boxes. So many tool boxes ... so little time. 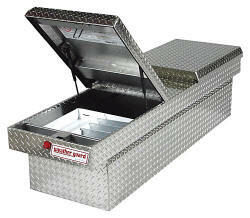 Diamond plate truck tool boxes are the most popular and come in such a variety of sizes and qualities. For about $200 you can go to your local Home Depot or Lowes and get a Husky truck tool box. They of course are built with cost in mind rather than quality so be careful. Most of the time these boxes have lower quality latching mechanisms and thinner skin. An insinuated "single wall" lid is common to keep costs down. So don't stand on it! Let's not forget the "special use" category. The "Swing box" would be something to check into. Mounted to the end of your bed on a heavy duty "swing" frame you have access to your entire bed as well as close up access to all your stuff.